Indian table tennis icon Achantha Sharath Kamal concluded India's table tennis campaign on Sunday by adding another medal to his name at Gold Coast. Kamal ended the Day 11 for the table tennis contingent by defeating Sam Walker of England to clinch the bronze medal in men's playoff match. Kamal outclassed Walker 4-1 (11-7, 11-9, 9-11, 11-6, 12-10) in the bronze medal match. The 35-year old is the only Indian to win the men's singles title at the Commonwealth Games. 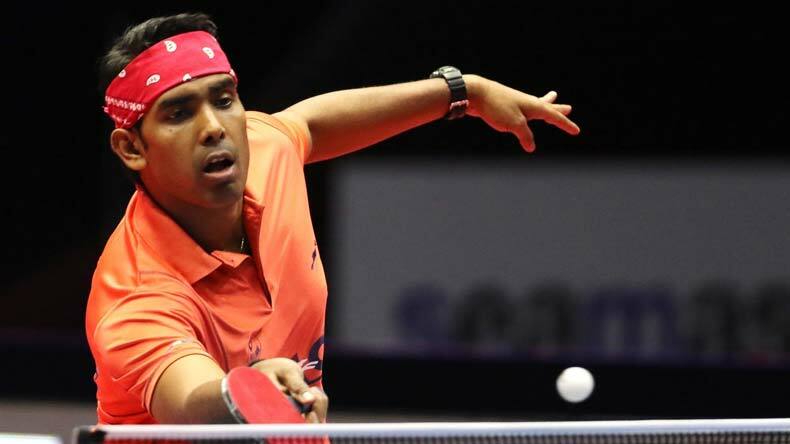 Indian table tennis star Achantha Sharath Kamal ended his 2018 Commonwealth Games campaign on Sunday with a third-place finish in men’s singles event at Gold Coast to take his CWG career medal tally to six. Kamal defeated Sam Walker of England to clinch the bronze medal in men’s play-off match at the Oxenford Studios. Kamal, who is the current World No 48 outclassed the Englishmen 4-1 (11-7, 11-9, 9-11, 11-6, 12-10) in the bronze medal match. The Indian table tennis veteran was once again at his level best as he wrapped up the first two games. Showing an impressive comeback in the third, Walker took the third game by a storm to reignite the bronze medal tie which was dominated by Sharath before then. The Indian continued his ruthless approach in the fourth game and wrapped up the tie in his favour despite Walker’s respectable comeback in the match. Sharath brought his A game with him to roadblock the Englishman in his pursuit for a bronze at Gold Coast. This was Sharath’s third medal in the 2018 Commonwealth Games at Gold Coast games. Earlier, the ace peddler had won silver in the doubles event and was also an integral part of the men’s team that also won gold at Gold Coast. The 35-year old had previously clinched Commonwealth Games singles medal after winning bronze at the 2010 Games. Before the New Delhi games, Sharath had gold in the 2006 edition. Sharath Kamal is still the only Indian to win the men’s singles title at the Commonwealth Games. Half a dozen for Sharath Kamal !! After clinching a Gold in the Men's team event in #GC2018TableTennis, Sharath Kamal sealed the match against England's Samuel Walker with a 🥉, bringing his CWG medal count to 6!